If we wanted to be happy it would be easy; but we want to be happier than other people, which is almost always difficult, since we think them happier than they are. You never really know what will work or what won't. If you believe in your idea, do it. As the whore said to the bashful sailor, "It ain't how much you've got, honey, it's how you use it." There will never be another now - I'll make the most of today. There will never be another me - I'll make the most of myself. Be like a duck, my mother used to tell me. Remain calm on the surface and paddle like hell underneath. The wide world is all about you: you can fence yourselves in, but you cannot for ever fence it out. It only takes one person to change your life – you. In almost all books on fiction writing, you will find advice that an aspiring writer should note down things such as interesting names, incidents, news and quotes, etc. These are supposed to provide you with inspiration when you are stuck somewhere in a story or need something interesting to write about. Well that was how my hobby of collecting quotes started. But after I started collecting them I realized I wasn’t collecting them just because I wanted to be a fiction writer someday. Quotes are more than that. They inspire you. They guide you. They amuse you. They entertain you. Sometimes when I get bored I just browse though my “Quotes Journal” and I have found that it is always an intellectually rewarding experience. I have decided to put together quotes from the journal in certain theme and post them here on my bolg. By no means I am trying to create a vast all-encompassing collection of quotes. These are just some interesting quotes put together to provide 10 minutes of amusement, entertainment and hopefully inspiration. Exactly what this man, Sachin Tendulkar, does? I wanted to post this quite a few days ago but somehow it got buried in my blog-about-this and blog-about-that notes. (Yes I really take notes like that!). This following statement explains why Sachin is the greatest cricketer of all time. It was posted by a commenter who identified himself as, dreamz1232 on an article by some Partab Ramchand on Yahoo Cricket. Mr. Ramchand was trying to explain why Sachin is not the greatest cricketer of all time. And for this post he got a lot of hate comments. ...exactly what this man, Sachin Tendulkar, does... he infuses hope...he spreads smile...he makes people cry...he makes hearts flutter...he evokes our passions...and most importantly, he makes millons of us forget our own miseries when he is batting...and Mr ram he does it all with a log of wood in his hand... and that is why i would say "HE IS THE GREATEST"!!! Maharashtra Navnirman Sena or MNS as we popularly know it is a political party started by Raj Thackeray. Navnirman means recreating something again. After all this violence and destruction of public property (which is paid for taxes paid by Maharashtrians) you wonder is this really ‘navnirman’? I think MNS should be relabeled as Maharashtra Destruction Sena. Why can’t today’s (so called) youth (if you look closely at the photographs, all you see are seasoned hooligans) look for more constructive ways to achieve their political goals? One of the regular rants that we hear from Raj Thackeray is that Maharashtrians are not given the Government jobs. But something to ponder is really how many of us ‘Marathi’ youths try their hardest to get a Govt. job? How many of us prepare for MPSC, UPSC and other Govt. exams as seriously as we prepare for our medical and engineering entrance exams? If we really want Maharashtrian youth to succeed in these exams, then why can’t we start free forums and coachings for those, who are needy and willing to give their best to get these posts? If Raj Thackeray asked, I am sure there will quite a few professors who will help to prepare notes and study materials to help these students. And as far as keeping Marathi youth informed about Govt. job openings and entrance exams is concerned, can’t we collect and republish this news in easily accessible format on online forums and local news papers. If Rajaji asks some papers to publish it, won’t they publish it? Or even better can’t MNS start a news paper (or do they have one already?) of its own and publish such information voluntarily? seems to be Raj Thackeray’s stance. Now we have got even more powerful India Destruction Sena. It's a question I often ask myself. Which political party should I support? Invariably the answer is ‘not a single one’. First I am a secular person who doesn’t believe in discrimination on the basis of caste, language and religion. This basically rules out BJP (remember Gujrat? ), Shivsena, MNS and the kith and kin. So if you don’t support BJP you vote for congress right (and for quite a few, it's other way round.)? Well in some ways I have thought of Congress positively since at least overtly they don’t support religious fundamentalism. But for long Congress has played the politics of minority which is heavily based on caste-based segregation of people. And please don’t even suggest Mayavati (Even thinking about it seems ludicrous). I really can’t identify with Mayavati (or that of Mulayam Singh, Amar Singh, Lalu Prasad Yadav and Mamata Banerjee) brand of politics. That leaves the leftists. But since their motto seems to be anything but progress and development so it pretty much rules them out. I, being a North Indian, (Where does Maharashtra come under? Should I call myself West Indian?) know little about South India and its politics (I know a very feeble excuse and something I really intend to change.) So really nothing to comment about there except for sometimes when you hear names like Jayalalitha and some news related to them. Mostly the news you hear about is something that makes you laugh and cry at the same time. As I say often, "It's a long life to live and there is hope." No this isn’t one of the antigod rants that you may have read before on this blog. But yes this post is about the God. The God of cricket, Sachin Ramesh Tendulkar. 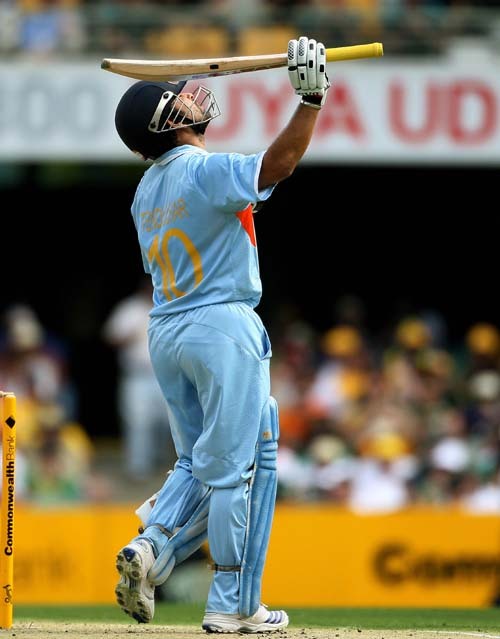 With his 88 runs innings against Australia, Sachin completed his 12,000 test runs and surpassed Brian Lara to become the highest run scorer in international test cricket. Sachin has been my favorite cricketer all my life. Through all his high and lows, I have been his supporter (and that meant having some of the biggest arguments with some of my best friends). But during past few days (days it is. OK?) with Sachin facing so many injuries and few of his dismal failures, I had started to doubt his abilities. I even said to one of my friends that probably the time has come for Sachin to move on. (Oh my God, I can’t believe I said that! Pardon me o almighty! I would never do such impertinent mistake in future.) But with this fine inning Sachin has regained my (and probably millions of others) faith in him. Sachin congratulations for yet another fine achievement! You are the best! We Live in a Strange World! "What are you thinking Eragon?" "That we live in a strange world and I will be lucky if I ever understand more than a small portion of it." Well Eragon truly lives in the strange fantastical world of Alagaesia where there are dwarfs, elves, kulls, shades and most importantly Dragons. I can't really claim to that we have those magical creatures but surely we have some really strange ones. Want to see more? Check out this page. OK this is one of those impromptu posts that I just have to write no matter where I am. Probably from the title of this post you have guessed that I have come to watch Drona. But it is nothing like a first day of a movie. The lobby is almost empty and nobody (I was hoping for a cute girl) is looking at me curiously as I furiously scribble this. I don't know why there are so few people. Probably because they are running like a dozen shows of the same movie and 7 o'clock (and I guess Mangala Theater too) is not hip for college students and IT people to come for a movie. Whatever, I love sitting in the lobbies of these multiplexes. The cool AC air, the posh snacks counter, (sometimes a face to die for) & of course the cutouts and posters of forthcoming movies. Right now I am staring shamelessly at the hot poster of Madhur Bhandarkar's next: Fashion. The poster is showing Priyanka Chopra, Mugdha Godase and Kangna Ranaut - all candid about their long legs. Now had I been a conservative, moral bound man, I would have shook my head and said, "This country is loosing all it's culture!" But I am not, so I totally enjoy the scene. Now at 6:43pm, screen4 is having intermission and quite a few people have come out to the snacks counter & I smell the awesome smell of coffee which I can't buy for fear of feeling guilty of wasting 15 rupees on such a small cup of coffee. Besides there will be the guilty feeling of excess eating since I just had a large cookie and tea before coming here. So I will just turn my head elsewhere. Ah! 90 rupees vasool! There is that cute face to die for. So I fulfill my obligatory quota of vitamin-I. And since now I have accomplished one objective to come to the movie, I should get inside the theater and watch the actual movie. Well what to say? Drona turned out to be total disappointment. There are so many things going wrong that it is hard to think of positives. First a bit about the story. Drona is story of a dynasty who is entrusted with the security of the nectar (amrut) that the Gods obtained at the time of samurda-manthan. Since by drinking this nectar one can live forever, a lot of ‘asurs’ have been trying to obtain the nector and for the centuries the dynasty is protecting the nector from these ‘asurs’. Every prince from this dynasty gains some special powers and weapons when he takes up the task to protect the ‘dron’ of the nectar. And since he is guarding the ‘dron’ he is called ‘drona’. So in our age the Drona is Aditya (Abhishek Bachchan) who is trying to protect the drona from Riz Raizaada (KK), an evil magician. So the movie is series of mysteries those must be solved to reach the nectar. Another problem is in these special effects and trying to impress with every movement of the character the director forgets that he needs to tell us a compelling story. We don’t feel the characters emotions. All of them are just caricatures with lackluster dialogs. Also the movie has big hangover of Hollywood. The start of the movie is very Harry Potterish. (Young orphan staying with horrible aunt). The evil minions of Riz Raizaada are shown like the kings with hollow black faces who served Sauron in Lord of the Rings. Another disappointing part the movie is action sequences and most importantly Priyanka Chopra. Priyanka Chopra disappoints big time. I don’t know who to blame? The stunts director is either seriously incompetent or had to compensate for lack of physical ability of Priyanaka. I think it was more of later. Why oh why, can’t we have superb action heroines like Anjelina Jolie, Kate Beckinsale, Jennifer Garner and countless others. Anyway, if you ask me, please don’t waste your hard earned money on this one. “Banks never loose.” is a sentence you come across a lot of times when you read novels with business and banking backgrounds. And in a way I believed that. Considering the business models of the banks and all the laws and regulations to govern and protect them, it is easy to believe that banks never loose. But last year changed this. We saw American financial institutions posting billions of dollars of losses. It is interesting to see almost all of an industry going wrong about the same thing. And that too something like finance sector, where most of the institutions are run by well qualified intellectual people. This has changed a lot in India too. I remember not even a year ago, when Sensex was soaring around 20,000 mark everybody was investing in share market. People were talking non stop about who made how much. People predicted that Sensex will go to 40,000 in a few years. About how India was becoming hot investment destination and all. Then bad things started to happen. Sensex plummeted. People started talking about slowdown in US economy. Software engineers discussed how companies had started to cut back on perks such as air travel. Then came the news of job cuts by various companies. Quite a few people decided to wait and not take home loans for lack of job security and rising interest rates. I know probably you know about all these things and may be wondering why I am writing these down. The reason for this is the first time in my 26 years of life I am witnessing how things, people and world change with economic cycles. Sure a lot of similar things must have happened before this but at that time I was either too young to understand the significance or too occupied in my little own world. It is fascinating to watch how public sentiment changes over the course of time. Today when I look at this scenario and think about my prospects as a future businessman, all these things evoke a whole gamut of emotions in my mind, sure there is fear and paranoia but also there is also a sense of opportunity, hope and surely the excitement of witnessing something profound (may be unfortunate but profound nonetheless) happening which will surely mark an important period in modern economic history.